Messi has been running riot in the past week with eight goals and two hat-tricks. (CNN) -- World Player of the Year Lionel Messi grabbed his second straight hat-trick in Spain's La Liga to power Barcelona to a 4-2 in over Real Zaragoza on Sunday night. Messi, who scored twice in the midweek Champions League defeat of Stuttgart, has scored eight goals in a week and 11 of Barca's last 14. He is also he leading scorer in the league with 25. The away victory sees the reigning champions draw level on points with leaders Real Madrid in the Spanish title race. They are a staggering 18 points clear of third placed Valencia, who won 2-0 against Almeria earlier in the day. It was Argentine star Messi's fifth hat-trick while at the Catalan giants and followed his triple in the 3-0 win over Valencia last weekend. Barcelona were playing catch up after Real's 3-1 win over Sporting Gijon the day before and were given the ideal start as Messi headed them in front on four minutes. His second goal came midway through the second half after a typically incisive run as the beat two players before scoring. 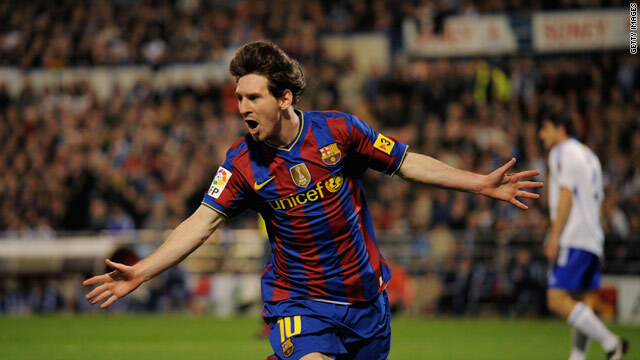 Messi soon completed his hat-trick before a double from home substitute Adrian Colunga gave Zaragoza late hope. But Messi was not to be denied after his earlier heroics and won a penalty which Swedish striker Zlatan Ibrahimovic converted in injury time, his first league goal since February 14. "Messi did well, I'll leave it for others to find the adjectives to describe him," Barcelona coach Pep Guardiola told AFP..
Valencia recovered from their drubbing against Barcelona and a midweek Europa League outing to post an easy win -- their first in three games. Almeria keeper Diego Alves kept them in the match which was scoreless at halftime, but he was beaten after the break as a fine pass from David Silva set up Juan Mata for the opener. Silva sealed the win as he scored from close range. Real Mallorca continued their fine form at home with a 4-1 thrashing of Atletico Madrid to stay in the fourth and final Champions League slot. Victor Casadesus scored their opener but Diego Forlan equalized for Atletico. But within two minutes Aritz Aduriz headed Mallorca in front again. Atletico had Raul Garcia sent off in the second half to seal their fate as a Luis Perea own goal and Felipe Mattioni strike made the game safe for Mallorca. "We showed that we are a strong and ambitious side who are candidates for a place in Europe," a delighted Mallorca coach Gregorio Manzano told AFP. "In the first half we were very good and then after the sending off we were able to control the play more easily." On Saturday, Real Madrid claimed their ninth straight victory but had to come from behind after David Barral scored. Real hit back through Rafael van der Vaart, Xabi Alonso and Gonzalo to open up a temporary three point gap on Barcelona.